Alter The Press! 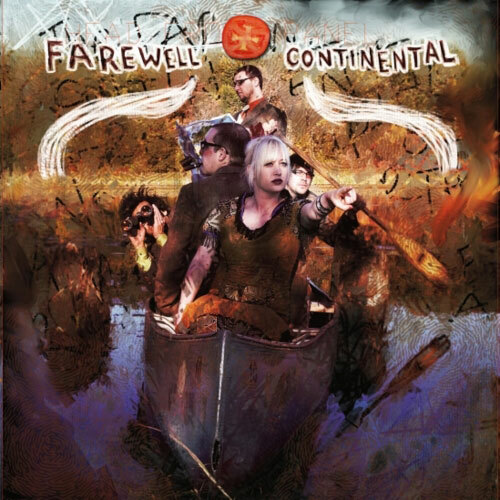 : Album Review: Farewell Continental - ¡Hey, Hey Pioneers! Album Review: Farewell Continental - ¡Hey, Hey Pioneers! Now that the respective alter egos of the members of Farewell Continental have been revealed, you'd think there wouldn't be much more mystery surrounding this band. With the title alone '¡Hey, Hey Pioneers! ', Farewell Continental strike up so many questions. Pioneers of what exactly? The band use this album as a definition of what they meant when they said pioneers. "Seasoned Veterans" starts out with a sombre introduction from Dr. Richard Kimbal (Justin Pierre of Motion City Soundtrack) that crescendos into a mess of guitars of hard hitting drums. Farewell Continental continue to create strange noises with their guitars as they experimented with on their second EP, the song "Capybara" (titled after guitarist Rick Deckard's obsession with the South American Capybara) presents a new level of dynamic variation, from a chilled out poppy verse into a killer chorus. Allie Fox's vocals on this record have improved in the short space inbetween the second EP and this album and have acquired a new confidence, they partciularly stand out on "The Greatest of All Time", especially during the chorus where she sings, "After the war I was waiting for you". Lyrics aren't exactly something you'd expect to be that good on this album. As with Pierre's band Motion City Soundtrack, the lyrics ring out Pierre's traditional surrealism but in Farewell Continental, there seems to be more of a fixture on the two characters of Richard Kimbal and Allie Fox communicating throughout the songs. Fans who asscociate Dr. Richard Kimbal/Justin Pierre with his original band Motion City Soundtrack will be surprised with his vocal range on this record. From the bass heavy, Stephen Malkmus influenced "Tiger Claw" to the stylistic, electro-inspired, change of "New Tile Floor". "¡Hey, Hey Pioneers!" is a collection of 14 simple, fun songs, all of which could be considered singles and all of which wouldn't sound out of place in the 1990's. With the drastic stylistic change between Motion City Soundtrack's last two albums, maybe this is a way for Pierre to explore his inner-1990s without changing the sound of the synth-pop aesthetic of Motion City Soundtrack. Despite not discovering anything new, you could say that Pierre is a pioneer of the 1990's Alternative/Indie sound.